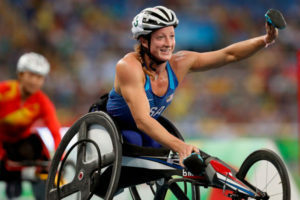 Tatyana McFadden, a five-time Bank of America Chicago Marathon winner and highly decorated US Paralympian, will kick off the 10th Annual Twilight 5K Run, Walk and Roll on Saturday September 9th at the Gorton Community Center in Lake Forest, IL. Tatyana has won four consecutive marathon grand slams (first place in Boston, Chicago, NYC and London marathons in the same year) and has broken five world records in track and field. She will kick off the FREE Children’s Fun Run (kids ages 10 and under) at 4:45pm and lead the 5K through the beautiful streets of Lake Forest starting at 5:15pm. Stick around for the post-race party which will immediately follow the end of the 5K featuring the music of Lake Forest’s own Suede Stout and Lynette Foss, delicious food and Tighthead beer. There will also be FREE Sprecher’s root beer and fun games for the kids.